The ECB has the model to understand the Great Recession – now use it! By chance I today found an ECB working paper from 2004 – “The Great Depression and the Friedman-Schwartz hypothesis” by Christiano, Motto and Rostagno. It is interesting stuff and you would imagine that the model developed in the paper could also shed light on the causes and possible cures for the Great Recession as well. The authors also answer the question about the appropriate policy response. “We finally conduct a counterfactual policy experiment designed to answer the following questions: could a different monetary policy have avoided the economic collapse of the 1930s? More generally: To what extent does the impossibility for central banks to cut the nominal interest rate to levels below zero stand in the way of a potent counter-deflationary monetary policy? Our answers are that indeed a different monetary policy could have turned the economic collapse of the 1930s into a far more moderate recession and that the central bank can resort to an appropriate management of expectations to circumvent – or at least loosen – the lower bound constraint. The counterfactual monetary policy that we study temporarily expands the growth rate in the monetary base in the wake of the money demand shocks that we identify. To ensure that this policy does not violate the zero lower-bound constraint on the interest rate, we consider quantitative policies which expand the monetary base in the periods a shock. By injecting an anticipated inflation effect into the interest rate, this delayed-response feature of our policy prevents the zero bound constraint from binding along the equilibrium paths that we consider. At the same time, by activating this channel, the central bank can secure control of the short-term real interest rate and, hence, aggregate spending. So what policy rule are the authors talking about? Well, it is basically a feedback rule where the money base is expanded to counteract negative shocks to money-velocity in the previous period. This is not completely a NGDP targeting rule, but it is close – at least in spirit. Under NGDP level targeting the central bank will increase in the money base to counteract shocks to velocity to keep NGDP on a stable growth path. The rule suggested in the paper is a soft version of this. It could obviously be very interesting to see how a real NGDP rule would have done in the model. Anyway, I can highly recommend the paper – especially to the members of the ECB’s The Governing Council and I see no reason that they should not implement a rule for the euro zone similar to the one suggested in the paper. If the ECB had such a rule in place then Spanish 10-year bond yields probably would not have been above 7% today. It is very easy to get frustrated about the discussion of monetary policy in today’s world. However, this morning we got something to cheer about as Vince Cable British Minister for Business, Innovation and Skills gave a speech on the UK recovery in the 1930s and the parallels to today’s crisis at the think tank Centre Forum. The entire speech is very uplifting. Yes, yes, yes! We should stop wrangling about fiscal policy. What brought Britain out of the Great Depression was the decision to give up the gold standard in 1931 and what will bring the UK economy out of this crisis is monetary easing. Fiscal policy in that regard is basically irrelevant. Luckily Vince Cable seems to comprehend that – as do Chancellor of the Exchequer George Osborn. Bank of England Governor Mervyn King might also (finally) get it. Yes again! The British economy was struggling to get out of the crisis because of a misguided commitment to the gold standard. Once the gold standard was given up it was recovery time. And luckily Vince Cable fully well knows that monetary easing also would do the trick today. Cable calls for an NGDP targeting regime! In 1931 the British government showed the way. I hope that today’s British government will show the same kind of resolve. Vince Cable gives me a lot of hope to be optimistic about that. Thank you Vince, you’ve made my day! As the euro crisis continues speculation of an eventual break-up of the euro also continues. There are numerous examples in monetary history of currency unions breaking up. One is the breakup of the Scandinavian Currency Union in 1924. I have found an interesting paper on this important event in Scandinavian monetary history. In his 2004-paper “The Decline and Fall of the Scandinavian Currency Union 1914 – 1924: Events in the Aftermath of World War I” Krim Talia discusses the reason for the collapse of the Scandinavian Currency Union. In 1873, Denmark, Norway and Sweden formed the Scandinavian Currency Union (SCU) and adopted the gold standard. The Union worked fairly smoothly during the next thirty years and was partly extended until 1914. The outbreak of World War I triggered a series of events that eventually would lead to the formal cancellation of the union in 1924. The suspension of convertibility and the export prohibition on gold in 1914, opened exchange rate tensions within the union, and acted as a first nail in the SCU’s coffin. Although the countries de facto had their currencies valued at different rates externally, the treaty of 1873 made them tradable at par within the union. This conflict, between de facto situation and de jure regulation, opened arbitrage opportunities for the public; but also resulted in opportunistic behaviour in the relation between the Scandinavian Central Banks. This study of the break-up of the SCU finds that the gold standard functioned as a unifying straitjacket on monetary policy and was an important prerequisite for a monetary union without a common central bank. It also challenges earlier work on the break-up of the SCU, by suggesting that the most important factor behind the centrifugal tensions within the Currency Union was the improved Swedish balance of trade following the outbreak of Word War I. The fact that wartime trade performance differed between the three countries made the currency area face an asymmetric external shock that required an exchange-rate adjustment – causing the fall of the union. What is the implication for the euro zone? Well, I am not sure, but it might be interesting to have a closer look at the internal trade imbalance in the Scandinavian currency union and compare that to the imbalances that we have seen build in the euro zone during the boom-year prior to 2008. Both Denmark and Norway saw booms (and bubbles) during the first World War years and the early 1920s. In that sense Denmark and Norway looked like today’s PIIGS, while Sweden with it’s increasing trade surplus was the Germany of the Scandinavian currency union. In my previous post I described how insane monetary tightening in Norway and Denmark after 1924 lead to depression, while Sweden avoided depression. History is fully of examples of massive monetary policy failure and today’s policy makers can learn a lot from studying these events and no one is better to learn from than Swedish monetary guru Gustav Cassel. In the 1920s Cassel tried – unfortunately without luck – to advise Danish and Norwegian policy makers from making a massive monetary policy mistake. After the First World War policy makers across Europe wanted to return to the gold standard and in many countries it became official policy to return to the pre-war gold parity despite massive inflation during the war. This was also the case in Denmark and Norway where policy makers decided to return the Norwegian and the Danish krone to the pre-war parity. The decision to bring back the currencies to the pre-war gold-parity brought massive economic and social hardship to Denmark and Norway in the 1920s and probably also killed of the traditionally strong support for laissez faire capitalism in the two countries. Paradoxically one can say that government failure opened the door for a massive expansion of the role of government in both countries’ economies. No one understood the political dangers of monetary policy failure better than Gustav Cassel. 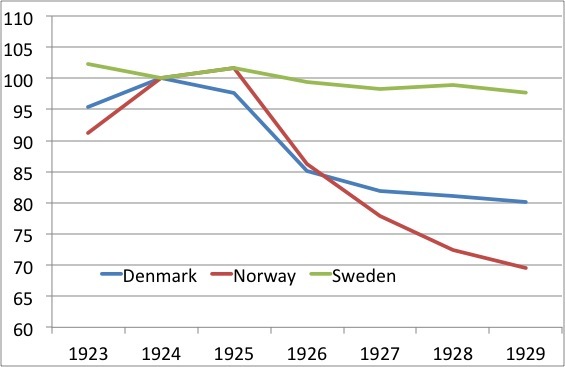 Here you see the impact of the Price Level (Index 1924=100) of the deflation policies in Denmark and Norway. Sweden did not go back to pre-war gold-parity. While most of the world was enjoying relatively high growth in the second half of the 1920s the Danish and the Norwegian authorities brought hardship to their nations through a deliberate policy of deflation. As a result both nations saw a sharp rise in unemployment and a steep decline in economic activity. So when anybody tells you about how a country can go through “internal devaluation” please remind them of the Denmark and Norway in the 1920s. The polices were hardly successful, but despite the clear negative consequences policy makers and many economists in the Denmark and Norway insisted that it was the right policy to return to the pre-war gold-parity. Here is what happened to unemployment (%). Nobody listened to Cassel. As a result both the Danish and the Norwegian economies went into depression in the second half of the 1920s and unemployment skyrocketed. At the same time Finland and Sweden – which did not return to the pre-war gold-partiy – enjoyed strong post-war growth and low unemployment. Gustav Cassel strongly warned against this policy as he today would have warned against the calls for “internal devaluation” in the euro zone. In 1924 Cassel at a speech in the Student Union in Copenhagen strongly advocated a devaluation of the Danish krone. The Danish central bank was not exactly pleased with Cassel’s message. However, the Danish central bank really had little to fear. Cassel’s message was overshadowed by the popular demand for what was called “Our old, honest krone”. To force the policy of revaluation and return to the old gold-parity the Danish central bank tightened monetary policy dramatically and the bank’s discount rate was hiked to 7% (this is more or less today’s level for Spanish bond yields). From 1924 to 1924 to 1927 both the Norwegian and the Danish krone were basically doubled in value against gold by deliberate actions of the two Scandinavian nation’s central bank. The gold-insanity was as widespread in Norway as in Denmark and also here Cassel was a lone voice of sanity. In a speech in Christiania (today’s Oslo) Cassel in November 1923 warned against the foolish idea of returning the Norwegian krone to the pre-war parity. The speech deeply upset Norwegian central bank governor Nicolai Rygg who was present at Cassel’s speech. After Cassel’s speech Rygg rose and told the audience that the Norwegian krone had been brought back to parity a 100 years before and that it could and should be done again. He said: “We must and we will go back and we will not give up”. Next day the Norwegian Prime Minister Abraham Berge in an public interview gave his full support to Rygg’s statement. It was clear the Norwegian central bank and the Norwegian government were determined to return to the pre-war gold-parity. This is the impact on the real GDP level of the gold-insanity in Denmark and Norway. 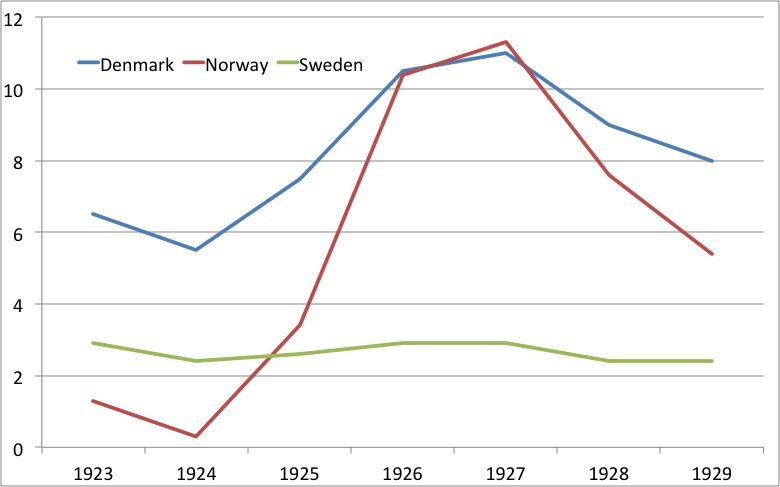 Sweden did not suffer from gold-insanity and grew nicely in the 1920s. The lack of reason among Danish and Norwegian central bankers in the 1920s is a reminder what happens once the “project” – whether the euro or the gold standard – becomes more important than economic reason and it shows that countries will suffer dire economic, social and political consequences when they are forced through “internal devaluation”. In both Denmark and Norway the deflation of the 1920s strengthened the Socialists parties and both the Norwegian and the Danish economies as a consequence moved away from the otherwise successful laissez faire model. That should be a reminder to any free market oriented commentators, policy makers and economists that a deliberate attempt of forcing countries through internal devaluation is likely to bring more socialism and less free markets. Gustav Cassel knew that – as do the Market Monetarists today. Update: Here is an example that not all German policy makers have studied economic and monetary history. Niall Ferguson and Nouriel Roubini have a comment in the Financial Times. I have great respect for both gentlemen – even though I often disagree with both of them – and their latest comment raises some very key issues concerning the future of the euro zone and Europe in general. And it is very timely given that this weekend the Spanish government has asked the EU for a massive new bail out. We fear that the German government’s policy of doing “too little too late” risks a repeat of precisely the crisis of the mid-20th century that European integration was designed to avoid. We find it extraordinary that it should be Germany, of all countries, that is failing to learn from history. Fixated on the non-threat of inflation, today’s Germans appear to attach more importance to 1923 (the year of hyperinflation) than to 1933 (the year democracy died). They would do well to remember how a European banking crisis two years before 1933 contributed directly to the breakdown of democracy not just in their own country but right across the European continent. Hear! Hear! I have often been alarmed how European policy makers are bringing up the risk of higher inflation (1923) rather than the risk of deflation (1392-33) and I have earlier said that 2011 was shaping out to be like 1931. Unfortunately it more and more seems like 2012 is turning out to be like 1932 for Europe. In the 1930s the crisis let to an attempt of a violent “unification” of Europe. This time around European policy makers are calling for more political integration to solve a monetary crisis despite the fact that European institutions like the ECB and the European Commission so far has failed utterly in solving the crisis. We all know that what is needed is not closer political integration in the EU, but monetary easing from the ECB. The ECB could end this crisis tomorrow, but the problem is that we apparently will only get monetary easing once further political integration is forced through. This is unfortunately what you get when political outcomes become part of the monetary policy reaction. Germany 1931, Argentina 2001 – Greece 2011? Please listen to Nicholas Craft! France caused the Great Depression – who caused the Great Recession? Who did most for the US stock market? FDR or Bernanke? While I was going through old Australian newspaper articles (don’t ask me why…) I came across a wonderful little article by Gustav Cassel published on February 17 1930. In the article Cassel spells out why fiscal policy would not be able to pull out the US of the Depression and why the Great Depression was caused by monetary policy failure. The whole thing sounds very Market Monetarist. I have reproduced the entire article below. Enjoy the wisdom of Gustav Cassel. It has been an open question for many years as to what Governments can do to counteract an economic depression… It has above all been suggested that public works should be regulated according to the fluctuations caused from time to time by economic conditions. In other words, the Government should start comprehensive undertakings at the moment when private enterprise begins to lag. The United States are at present in such a condition. Under the energetic leadership of President Hoover it seems that the Government is to intervene promptly and effectively in order to prevent the Stock Exchange crisis from developing into an economic depression. This case can provide a most useful lesson for the general treatment of this problem and deserves special attention because Europe is more or less bound to be affected by an American depression and will then have to face the same difficulties against which America is fighting today. President Hoover’s programme, which has been given the name of ‘Prosperity Maintenance’ mainly comprises the starting of big undertakings in order to prevent the threatened reduction of industrial employment. To this purpose the official departments are to co-operate with the private employers. The President called together at the White House several groups representing the economic activity of the country, and the representatives of the railways at once assured him of their cooperation in the form of a comprehensive programme of extensions. Apart from a certain psychological influence, the President’s programme, is, however, in every way a mistake. It rests not only on an incorrect conception of the actual conditions, but also on an over-estimate the Government’s power. In the endeavours to create employment by extraordinary new enterprises, it must be remembered very clearly that the burden will fill on the nation’s savings and reduce the amount of money available for the increase of true capital. An intervention by the State in order to increase the existing works and their machinery equipment might possibly be a sensible policy if a surplus of savings were available. The Hoover programme seems to assume that it is the case. In his message to Congress the President has proclaimed to the whole world that hitherto American capital was invested to an extraordinarily large proportion in stock speculation. The crisis is now said to have set this capital free, and made it available for general economic enterprises. The ‘Government therefore considered it to be their duty to find employment for the capital supply. Every link in this chain or argument is a fallacy. Speculation in stocks has never involved any capital and cannot involve any. Therefore no capital can flow back from the Stock Exchange to economic enterprise. After all, America has no more available capital requiring a special effort for its employment. The American Stock Exchange crisis signifies no more than that exaggerated quotations have been reduced to their normal value. There is no crisis in the economic life, but only a certain reduction of capital available, mostly for the building of dwelling houses. This reduction is caused immediately by the fact that the current new savings were not sufficient to maintain the production of real capital in the enormous proportions of last year. The outstanding feature of the present position is therefore undoubtedly a great scarcity of capital. This being the case, is it not foolish to undertake large new enterprises in the belief that they can be paid for with available capital? Any effort in this direction, especially if made by the Government, is bound to waste the already scarce reserves, and thus to weaken the entire political economy. That scarcity of capital is the principal feature of the present situation is also shown by the fact that the export of American capital has decreased very considerably indeed. If more surplus money were offered America would increase its export of capital and thereby improve the purchasing power of the other countries for the American export products. This would free the Government from many cares concerning inner political economy and at the same time render superfluous its efforts to exert its political power in creating outlets for American exports. Such a development would be most welcome to all the countries needing capital. Conditions, the whole world over have shaped themselves in such a way that the export of American capital is an indispensable condition for a prosperous world economy. The whole world must therefore view with grave concern a Government intervention which, on account of its uneconomic investments, is bound to render impossible the accumulation of American savings. Government intervention is in this case obviously to the detriment of the economic organisation. It would be far better to leave that organisation to look after itself. If this were done, any available new surplus money would very quickly be put, to use, provided that no new hindering circumstances should arise. An important American journal has recently collected a number of views on this subject by industrial leaders. The general impression to be gathered from this inquiry is that the industrialists intend to carry on, notwithstanding the Stock Exchange crisis. In most branches of industry there is an acute necessity to enlarge the buildings and to improve the equipment. On reading the inquiry made by this journal we certainly do not feel that there is any lack of opportunities to use any available American capital. In the present situation there is indeed only one single factor which can seriously hinder development and this one factor has its origin in a Government Department. I am referring to the bank rate policy or in a wider sense to the limitation of money supplies to the economic life by the Federal Reserve System. This limitation has of late been far too strict. The reason is the attempt to regulate the bank rate in such a way that it, would have a supreme influence on the Stock Exchange, limiting the speculative inflation of share prices. There is no doubt that this attempt constitutes an improper transgression of the natural limits of the tasks evolving upon a central banking institution – an attempt which ultimately can be traced back to the ardent desire of the Government to usurp an ever growing share of influence upon the country’s political economy. It is true that after the Stock Exchange crisis the bank rate has been slightly reduced. But this measure was taken far too slowly and hesitatingly. The Federal Reserve system has not kept pace with the development, but since the last summer has adhered to rates which were far too high, with the result of a collapse in prices which seriously endangered the whole political economy, and which, so long as it continues will naturally prevent any sensible persons from making new investments. If the fall in prices were to continue, this would unavoidably prevent American economy from continuing its recent wonderful developments. The collapse in prices is bound to drag with it the whole of the rest of the world and to create a universal condition which must react on the economy of the United States. And all this entirely unnecessary collapse of prices is exclusively the result of the mishandling of the American dollar value which in its turn is the consequence of an uncalled for excursion of Government influence into the province of economic problems. The whole matter is a blatant example of what happens if we yield to the modern tendency of permitting the Government to meddle unnecessarily with economics. The Government assumes a task which is not in its province; in consequence of this it is driven to mismanage one of its most pertinent tasks, i.e., the supervision of money resources, this causes a depression, which the same government seeks to remedy by measures which are again outside the sphere of its true activity and which can only make the whole position worse. The particular case under review is really only an illustration of a phenomenon which at present is very general; while neglecting their proper functions, governments greedily seize every opportunity to usurp provinces which are not their concern, and by doing so place themselves – with or against their will – on a plane inclined towards a form of socialism, the aim of which is, in this respect, to risk everything to obtain the utmost. And Steve Horwitz on why Hoover was an interventionist. So what is Bernanke saying – well he sounds like a Keynesian who believes that we are in a liquidity trap and that monetary policy is inefficient. It is near-tragic that Bernanke uses the exact same wording as Bundesbank chief Jens Weidmann used recently (See here). While Bernanke is a keynesian Weidmann is a calvinist. Bernanke wants looser fiscal policy – Weidmann wants fiscal tightening. However, what they both have in common is that they are central bankers who apparently don’t think that nominal GDP is determined by monetary policy. Said, in another other way they say that nominal stability is not the responsibility of the central bank. You can then wonder what they then think central banks can do. What both Weidmann and Bernanke effectively are saying is that they can not do anymore. They are out of ammunition. This is the good old “pushing on a string” excuse for monetary in-action. This is of course nonsense. The central bank can determine whatever level for nominal GDP it wants. Just ask Gedeon Gono. It is incredible that we four years into this mess still have central bankers from the biggest central banks in the world who are making the same mistakes as central bankers did during the Great Depression. It is tragic that the same day Scott quotes d’Abernon Ben Bernanke “wrangles about fiscal remedies”. Bernanke of course full well knows that the impact on nominal GDP and prices of fiscal policy depends 100% on actions of the Federal Reserve. Fiscal policy does not determine the level of NGDP – monetary policy determines NGDP (Remember MV=PY!). UPDATE: Maybe our New Lords of Finance should read this Easy Guide to Monetary Policy. Take a look at the report. The whole thing is outrageous – the world is falling apart and it is written very much as it is all business as usual. More and more countries are leaving the the gold standard and there had been massive bank runs across Europe and a number of countries in Europe had defaulted in 1932 (including Greece and Hungary!) Hitler had just become chancellor in Germany. And then the report state: “the gold standard remains the best available monetary mechanism”! It makes you wonder how anybody can reach such a conclusion and in hindsight obviously today’s economic historians will say that it was a collective psychosis – central bankers were suffering from some kind of irrational “gold standard mentality” that led them to insanely damaging conclusions, which brought deflation, depression and war to Europe. I wonder what economic historians will say in 7-8 decades about today’s central bankers. Completely unrelated take a look at this story about Bundesbank chief Jens Weidmann. Meanwhile in Greece you have this and in Hungary you have this. The weekend’s Greek elections brought a neo-nazi party (“Golden Dawn”) into the Greek parliament. The outcome of the Greek elections made me think about the German parliament elections in July 1932 which gave a stunning victory to Hitler’s nazi party. The Communist Party and other extreme leftist also did well in the Greek elections as they did in Germany in 1932. I am tempted to say that fascism is always and everywhere a monetary phenomenon. At least that was the case in Germany in 1932 as it is today in Greece. And as in 1932 central bankers does not seem to realise the connection between monetary strangulation and the rise of extremist political forces. The rise of Hitler in 1932 was to a large extent a result of the deflationary policies of the German Reichbank under the leadership of the notorious Hjalmar Schacht who later served in Hitler’s government as Economics Ministers. Schacht was both a hero and a villain. He successfully ended the 1923 German hyperinflation, but he also was a staunch supporter of the gold standard which lead to massive German deflation that laid the foundation for Hitler’s rise to power. After Hitler’s rise to power Schacht helped implement draconian policies, which effectively turned Germany into a planned economy that lead to the suffering of millions of Germans and he was instrumental in bringing in policies to support Hitler’s rearmament policies. However, he also played a (minor) role in the German resistance movement to Hitler. The good and bad legacy of Hjalmar Schacht is a reminder that central bankers can do good and bad, but also that central bankers very seldom will admit when they make mistakes. This is what Matthew Yglesias in a blog post from last year called the Perverse Reputational Incentives In Central Banking. I was reading recently in Hjalmar Schacht’s biography Confessions of the Old Wizard … and part of what’s so incredible about it are that Schacht’s two great achievements—the Weimar-era whipping of hyperinflation and the Nazi-era whipping of deflation—were both so easy. The both involved, in essence, simply deciding that the central bank actually wanted to solve the problem. …The institutional and psychological problem here turns out to be really severe. If the Federal Reserve Open Market Committee were to take strong action at its next meeting and put the United States on a path to rapid catch-up growth, all that would do is serve to vindicate the position of the Fed’s critics that it’s been screwing up for years now. Rather than looking like geniuses for solving the problem, they would look like idiots for having let it fester so long. By contrast, if you were to appoint an entirely new team then their reputational incentives would point in the direction of fixing the problem as soon as possible. Matt is of course very right. Central banks and central banks alone determines inflation, deflation, the price level and nominal GDP. Therefore central banks are responsible if we get hyperinflation, debt-deflation or a massive drop in nominal GDP. However, central bankers seem to think that they are only in control of these factors when they are “on track”, but once the nominal variables move “off track” then it is the mistake of speculators, labour unions or irresponsible politicians. Just think of how Fed chief Arthur Burns kept demanding wage and price controls in the early 1970s to curb inflationary pressures he created himself by excessive money issuance. The credo seems to be that central bankers are never to blame. Contrary to widespread belief, monetary policy is not a panacea and central banks’ firepower is not unlimited, especially not in the monetary union. First, to protect their independence central banks in the eurozone face clear constraints to the risks they are allowed to take. …Second, unconditional further easing would ignore the lessons learned from the financial crisis. This crisis is exceptional in scale and scope and extraordinary times do call for extraordinary measures. But we have to make sure that by putting out the fire now, we are not unwittingly preparing the ground for the next one. The medicine of a near-zero interest rate policy combined with large-scale intervention in financial markets does not come without side effects – which are all the more severe, the longer the drug is administered. I don’t feel like commenting more on Weidmann’s comments (you can pretty well guess what I think…), but I do note that German long-term bond yields today have inch down further and is now at record low levels. Normally long-term bond yields and NGDP growth tend to move more or less in sync – so with German government 10-year bond yields at 1.5% we can safely say that the markets are not exactly afraid of inflation. Or said in another way, if ECB deliver 2% inflation in line with its inflation target over the coming decade then you will be loosing 1/2% every year by holding German government bonds. This is not exactly an indication that we are about to repeat the mistakes of the Reichbank in 1923, but rather an indication that we are in the process of repeating the mistakes of 1932. The Greek election is sad testimony to that. PPS Scott Sumner today compares the newly elected French president Francois Hollande with Léon Blum. I have been having been thinking the same thing. Léon Blum served as French Prime Minister from June 1936 to June 1937. Blum of course gave up the gold standard in 1936 and allowed a 25% devaluation of the French franc. While most of Blum’s economic policies were grossly misguided the devaluation of the franc nonetheless did the job – the French economy started a gradual recovery. Unfortunately at that time the gold standard had already destroyed Europe’s economy and the next thing that followed was World War II. I wonder if central bankers ever study history…They might want to start with Adam Tooze’s Wages of Destruction. Update: See Matt O’Brien’s story on “Europe’s FDR? How France’s New President Could Save Europe”. Matt is making the same point as me – just a lot more forcefully. Since the ECB introduced it’s 3-year LTRO on December 8 the signs that we are emerging from the crisis have grown stronger. This has been visible with stock prices rebounding strongly, long US bond yields have started to inch up and commodity prices have increased. This is all signs of easier monetary conditions globally. We are now a couple of months into the market recovery and especially the recovery in commodity prices should soon be visible in US and European headline inflation and will likely soon begin to enter into the communication of central bankers around the world. This has reminded me of the “recession in the depression” in 1937. After FDR gave up the gold standard in 1933 the global economy started to recover and by 1937 US industrial production had basically returned to the 1929-level. The easing of global monetary conditions and the following recovery had spurred global commodity prices and by 1937 policy makers in the US started to worry about inflationary pressures. However, in the second half of 1936 US economic activity and the US stock market went into a free fall and inflationary concerns soon disappeared. 1) Milton Friedman and Anna Schwartz in their famous Monetary History highlighted the fact that the Federal Reserve’s decision to increase reserve requirements starting in July 1936 was what caused the recession of 1937. 2) Douglas Irwin has – in an excellent working paper from last year – claimed that it was not the Fed, but rather the US Treasury that caused the the recession as the Treasury moved aggressively to sterilize gold inflows into the US and thereby caused the US money supply to drop. 3) While 1) and 2) regard direct monetary actions the third explanation regards the change in the communication of US policy makers. Hence, Gauti B. Eggertsson and Benjamin Pugsley in an extremely interesting paper from 2006 argue that it was the communication about monetary and exchange rate policy that caused the recession of 1937. As Scott Sumner argues monetary policy works with long and variables leads. Eggertson and Pugsley argue exactly the same. In my view all three explanations clearly are valid. However, I would probably question Friedman’s and Schwartz’s explanation on it’s own as being enough to explain the recession of 1937. I have three reasons to be slightly skeptical about the Friedman-Schwartz explanation. First, if indeed the tightening of reserve requirements caused the recession then it is somewhat odd that the market reaction to the announcement of the tightening of reserve requirements was so slow to impact the stock markets and the commodity prices. In fact the announcement of the increase in reserve requirements in July 1936 did not have any visible impact on stock prices when they were introduced. Second, it is also notable that there seems to have been little reference to the increased reserve requirement in the US financial media when the collapse started in the second half of 1937 – a year after the initial increase in reserve requirements. Third, Calomiris, Mason and Wheelock in paper from 2011 have demonstrated that banks already where holding large excess reserves and the increase in reserve requirements really was not very binding for many banks. That said, even if the increase in reserve requirement might not have been all that binding it nonetheless sent a clear signal about the Fed’s inflation worries and therefore probably was not irrelevant. More on that below. Doug Irwin’s explanation that it was actually the US Treasury that caused the trouble through gold sterilization rather than the Fed through higher reserve requirements in my view has a lot of merit and I strongly recommend to everybody to read Doug’s paper on Gold Sterilization and the Recession 1937-38 in which he presents quite strong evidence that the gold sterilization caused the US money supply to drop sharply in 1937. That being said, that explanation does not fit perfectly well with the price action in the stock market and commodity prices either. Hence, I believe we need to take into account the combined actions of the of the US Treasury (including comments from President Roosevelt) and the Federal Reserve caused a marked shift in expectations in a strongly deflationary direction. In their 2006 paper Eggertsson and Pugsley “The Mistake of 1937: A General Equilibrium Analysis” make this point forcefully (even though I have some reservations about their discussion of the monetary transmission mechanism). In my view it is very clear that both the Roosevelt administration and the Fed were quite worried about the inflationary risks and as a consequence increasing signaled that more monetary tightening would be forthcoming. In that sense the 1937 recession is a depressing reminder of the strength of the of the Chuck Norris effect – here in the reserve form. The fact that investors, consumers etc were led to believe that monetary conditions would be tightened caused an increase in money demand and led to an passive tightening of monetary conditions in the second half of 1937 – and things obviously were not made better by the Fed and US Treasury actually then also actively tightened monetary conditions. The risk of repeating the mistakes of 1937 – we did that in 2011! Will we do it again in 2012 or 2013? So why is all this important? Because we risk repeating the mistakes of 1937. In 1937 US policy makers reacted to rising commodity prices and inflation fears by tightening monetary policy and even more important created uncertainty about the outlook for monetary policy. At the time the Federal Reserve failed to clearly state what nominal policy rule it wanted to implemented and as a result caused a spike in money demand. So where are we today? Well, we might be on the way out of the crisis after the Federal Reserve and particularly the ECB finally came to acknowledged that a easing of monetary conditions was needed. However, we are already hearing voices arguing that rising commodity prices are posing an inflationary risk so monetary policy needs to be tighten and as neither the Fed nor the ECB has a very clearly defined nominal target we are doomed to see continued uncertainty about when and if the ECB and the Fed will tighten monetary policy. In fact this is exactly what happened in 2011. As the Fed’s QE2 pushed up commodity prices and the ECB moved to prematurely tighten monetary policy. To make matters worse extremely unclear signals about monetary policy from European central bankers caused market participants fear that the ECB was scaling back monetary easing. Therefore we can only hope that this time around policy makers will have learned the lesson from 1937 and not prematurely tighten monetary policy and even more important we can only hope that central banks will become much more clear regarding their nominal targets. Any market monetarist will of course tell you that central bankers should not fear overdoing their monetary easing if they clearly define their nominal targets (preferably a NGDP level target) – that would ensure that monetary policy is not tightened prematurely and a well-timed exist from monetary easing is ensured. PS I have an (very unclear!) idea that the so-called Tripartite Agreement from September 1936 b the US, Great Britain and France to stabilize their nations’ currencies both at home and in the international FX markets might have played a role in causing a change in expectations as it basically told market participants that the days of “currency war” and competitive devaluations had come to an end. Might this have been seen as a signal to market participants that central banks would not compete to increase the money supply? This is just a hypothesis and I have done absolutely no work on it, but maybe some young scholar would like to pick you this idea?